It has been proven that aquariums are actually beneficial for our health. Just being able to observe the marine creatures residing within an aquarium causes drop in heart rate and lower blood pressure. Keeping an aquarium inside your home, instead of having to visit the public aquariums, can increase the benefits as you can observe your fish and plants daily. These benefits can increase significantly if you have an aquarium inside your home, because you can observe your fish and plants daily. But maintaining an aquarium isn’t all that easy. While your fish and plants provide you the relaxation you need, you also have to give them care and ensure that they are in good . A step you might need to take is getting an aquarium thermometer. So How Do You Choose a Thermometer? Reviews SODIAL(R) New Fish Tank ThermometerLCR Hallcrest A-1005 Liquid Crystal Vertical Aquarium ThermometerZacro LCD Digital Aquarium ThermometerTAAM Rio Aquarium And Pond Floating ThermometerRISEPRO 2-Pack Digital Water ThermometerWhat’s The Verdict? What Are Benefits Of Having An Aquarium Thermometer? One of the most vital things in keeping aquatic creatures is knowing the water temperature they need to survive, which has to remain , and the only way for you to observe and maintain it properly is installing a thermometer. Some thermometers can even provide an alert feature that sets off an alarm whenever the water temperature changes from the ideal range (we’ll get to this later on). Knowing your aquarium’s water temperature allows you to monitor your fish and plants properly. It helps you be more aware of the changes in the temperature that may affect the health of aquatic life. Most thermometers are also inexpensive, however, this may vary depending on the types of thermometer that you want to get. There are primarily three types of aquarium thermometers. This type of thermometer comes in the form of a vertical or horizontal strip that you can stick on the outside wall of the aquarium. 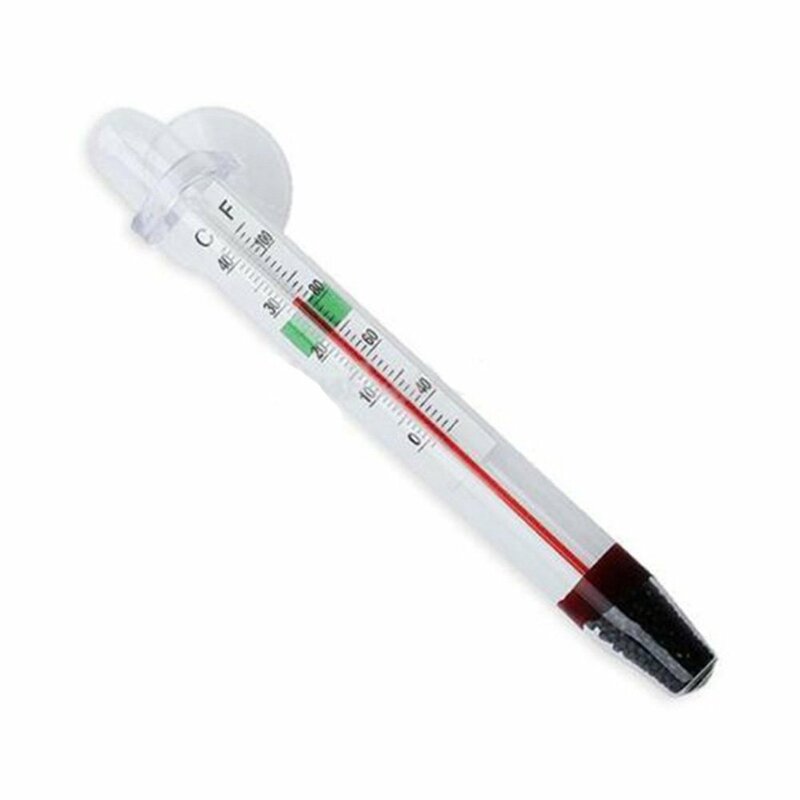 The advantage of getting this type of thermometer is that they’re easy to use and are pretty much unbreakable. They can show you either Celsius or Fahrenheit readings (or both!) and you have the option of placing them on an area that will not obstruct your aquarium’s aesthetics. One of the downsides of using this, however, is that readings can be inaccurate due to the thermometer being placed outside of the aquarium. The room temperature may also affect the thermometer, so it would be advisable to stick the strip on an area away from direct sources of heat or cold, such as sunlight and air conditioner. It is also recommended to avoid placing the thermometer below gravel level as the reading may not be as accurate as well. The most ideal way of using the LCD thermometer is when it’s viewed straight on, as this is how it can read temperature best. This type of thermometer can be hard to read in low light and it does not come with an alert feature. This is the type of thermometer that needs to be submerged in the water. There are various styles of floating or standing thermometers as well—there is the one that can be stuck to the inner walls of the tank using a suction cup; magnetic one that can be held by a magnet on the outside; those that are hanging by a clip; that can simply free float in the water; and , that weighted down to sink and stand on the bottom of the aquarium. Regardless of the style of the thermometer, this type can accurately read water temperature as it is submerged. The room or air temperature has no effect on it. There are disadvantages this type (of thermometer), however. One is the fact that it can be difficult to read—not only because it’s submerged, but also because the scale often has smaller numbers compared to other thermometers. Another downside is that most of these thermometers are made of glass, which means it is breakable. If your fish moves around a lot, it might not be advisable to use a free floating glass thermometer. On a good note, there are models that are made of plastic or stainless steel, which are both more durable than glass. Similar to the stick-on thermometer, this type also does not have any alert features. However, this makes them inexpensive, which may be good if you’re on a tight budget. While you can choose the style that you prefer, the best way to use a floating or standing thermometer is by sticking them to the inner tank using a suction cup. This way, the device will not get in the way of your fish, plants and ornaments. You also avoid the risk of infecting the water if ever the glass-type thermometer breaks. These thermometers come with a probe that is placed inside the tank and is connected to a digital display outside. There are models that have a cord physically connecting the probe and the display, while there are also wireless types. Most of these thermometers are battery-operated, however, some high-end models also come with a plug that you can connect to your wall sockets or to an extension cord. Some of the pricier models come with an alert feature that will blare an alarm when the temperature rises or falls from the desired range. Because the probe is dipped into the water, the temperature reading is just as accurate as the floating type. It is also easy to read, similar to the LCD stick-on type, as the display is placed outside the aquarium. The only drawback for this type is that it’s generally more expensive. Since it’s either battery-operated or plugged, continuous use also means additional expenses. 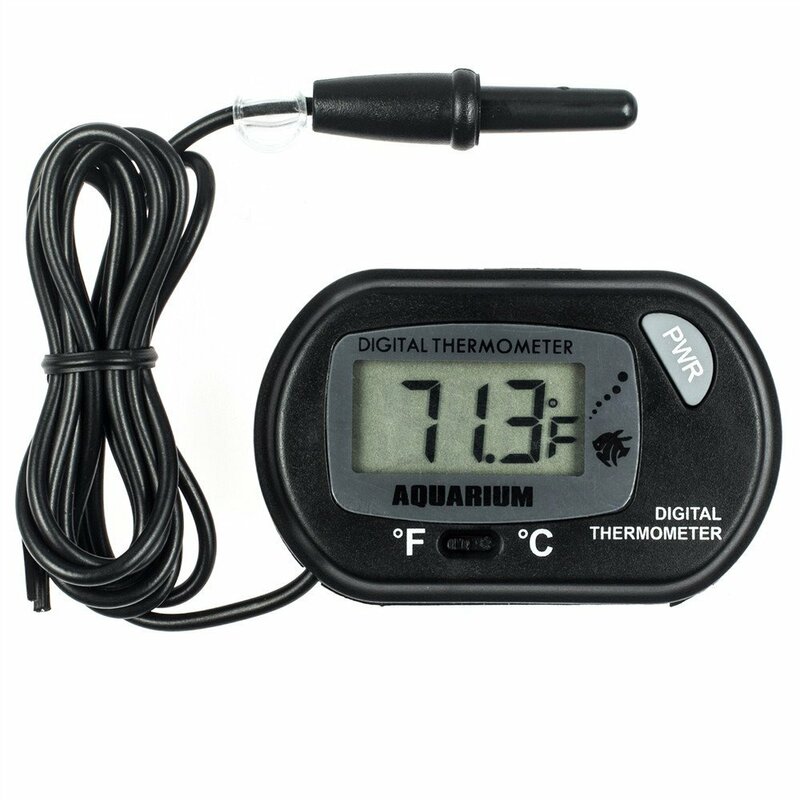 The most recommended way to use this type of thermometer is to stick the digital display on the outer tank using a suction cup, while the probe is submerged in the water. This way, you can easily view the temperature and the thermometer would not be moved around unnecessarily. So How Do You Choose a Thermometer? You have to weigh the pros and cons of each type against your own situation. If the room where your aquarium is located generally does not change in temperature (e.g. no aircon or vents, thick curtains that prevent sunlight from coming in), then the LCD stick-on may be a good choice. However, if you’re on a tight budget and your room temperature sometimes goes from warm to cool, it might be a better choice to go for a floating or standing type. If you have the budget and you want both the accuracy and convenience, the digital type might be the perfect choice. Another thing to consider is the type of fish residing in your aquarium. Some thermometers have a limited temperature range. For example, most floating and LCD stick-on thermometers can only read from 0 to 40 degrees Celsius. Meanwhile, many digital thermometers are capable of reading from -50 up to +70 degrees Celsius. That’s an enormous difference, and it may or may not matter depending on what kind of fish you keep. Additionally, if you’re a buyer who likes the assurance of having a warranty, this is another factor to think about as well. Many of the thermometers on the cheaper side do not come with warranties. The amount of cleaning and maintenance you’re willing to do matters as well. If you would prefer not having to clean your thermometer regularly, the LCD stick-on type or the digital type may be more suitable for you. If you don’t mind cleaning regularly, and would like to save more money, the floating thermometer may be ideal. To help you choose, we’ve listed up 5 top-rated aquarium thermometers. All three types—floating or standing, LCD stick-on, and digital—can be seen on this list. A floating type thermometer that features a suction cup for easy installation. It’s made of glass, and features a green indicator for easier reading. Since it’s one of the submersible types, it provides an accurate reading of the water temperature. Comes with suction cup, hence, easy to install. Has a green indicator for easier reading. Shows both Fahrenheit and Celsius readings. Made of glass and is breakable. Glass type thermometers are also more prone to algae and would need to be cleaned regularly. A limited range of 0 to 40 degrees Celsius. Does not come with alert feature. This LCD stick-on thermometer is a vertical model, featuring large numbers that are easy-to-read even from afar. It is easily installed due to its adhesive back—you just have to stick it on the outer glass. It also shows different colors for more convenient readings. No need to clean regularly as it’s supposed to be placed on the outside of the tank. Shows large numbers that allows you to see the readings even from afar. Can provide accurate readings if room temperature is kept consistent. Can provide inaccurate readings if the room temperature changes every now and then. Limited range of 66 to 84 degrees Fahrenheit. A best-selling digital thermometer that comes with a suction cup, allowing for easier installation. It also has an easy-to-read LCD screen that provides temperature readings to within 0.1 degree. The probe is connected physically to the thermometer. The wide temperature range makes this a good choice for those who keep tropical, coldwater, and other types of fish in separate aquariums. LR44 Batteries are also included in the package. Affordable, even though it’s a digital type. Wide range of -50 to +70 degrees Celsius. Can show both Celsius and Fahrenheit readings. Easy to install due to suction cup. Pricier compared to the LCD stick-on and floating types. 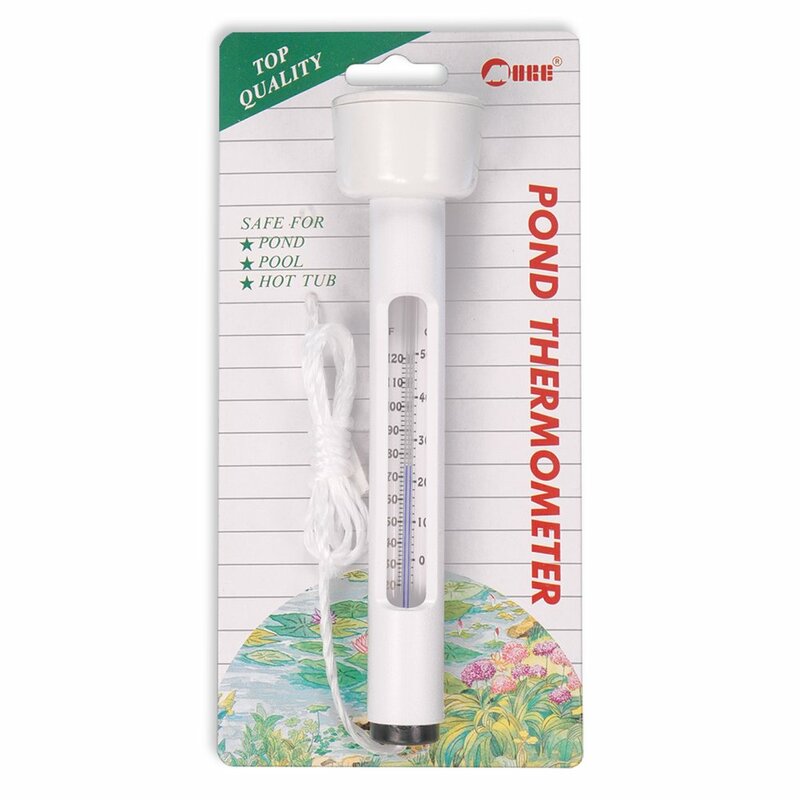 This floating thermometer can be used not only for an aquarium, but also for a pond. It is made of durable plastic that can withstand impacts and can display temperature in both Celsius and Fahrenheit. It also comes with a 34-inch rope to easily secure it, should you decide to use it on a pond. Since it is a floating thermometer, it will have more accurate readings compared to the LCD stick-on. More durable compared to its glass counterparts. Can show readings in both Celsius and Fahrenheit. Can be used for both aquariums and ponds. Shows accurate temperature readings because it is submerged in the water. Might look big and unsightly on an aquarium. Price is higher than others on this list, despite being a floating thermometer. Limited range of 0 to 50 degrees Celsius. Would also require regular cleaning due to algae. The RISEPRO Digital Water Thermometer comes in a pack of two, and it’s surprisingly affordable. It comes with suction cups that are easy to install and has a wide temperature range of -50 to +70 degrees Celsius. Like most digital thermometers, it is battery-operated and comes with four LR44 batteries, two of which are spare. It is also packaged nicely in a box that provides instructions. Very affordable – you get two thermometers. Can display temperature both in Celsius and in Fahrenheit. Wide temperature range, which makes it good for any type of aquarium. Suction cups for easy installation. No alert and alarm feature. While affordable, it’s still pricier compared to the LCD stick-on and floating types. If you’re finding it hard to decide, our best pick would be the best-selling Zacro LCD Digital Aquarium Thermometer. It was a close call between the two digital thermometers. 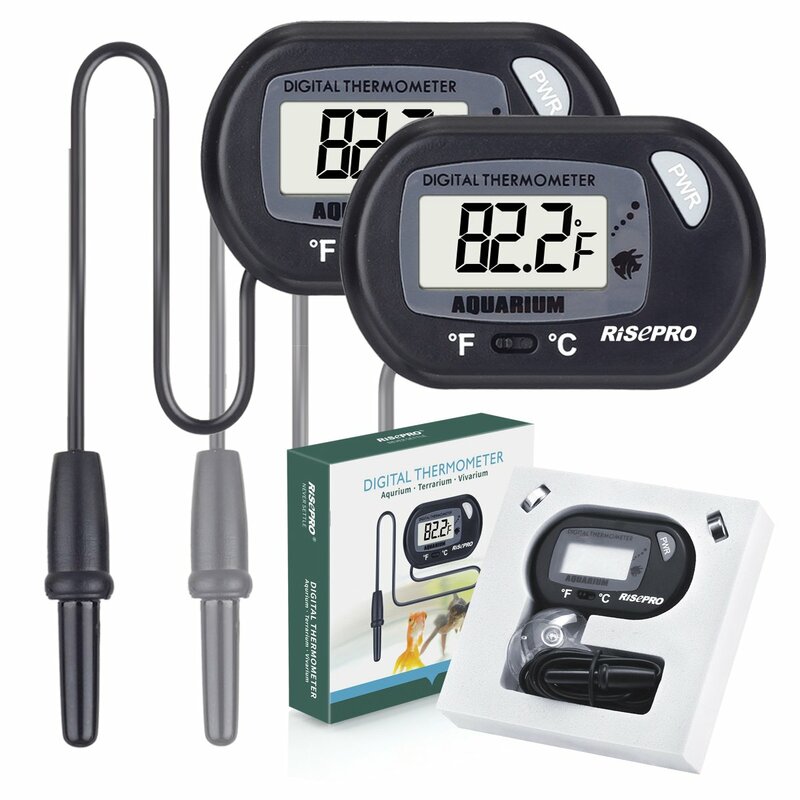 After all, the RISEPRO 2-Pack Digital Water Thermometer will give you not one, but TWO thermometers, and extra batteries! However, the Zacro Thermometer won us over due to its 24-month warranty. Because of its wide range, it can be used for any type of aquarium, offering flexibility that the LCD stick-on and floating types cannot provide. It’s affordable too! Regardless, all of these aquarium thermometers are great on their own. They are suitable to the needs of various people…or in this case, fish and plants. You just have to weigh the pros and cons and see which product fits your situation more.